When the HP ProLiant Server OS Deployment kit is installed, objects such as boot images, software packages, and driver packages, need to be distributed to distribution points to be utilized by the operating system deployment tasks. From the console, open the Computer Management>Operating System Deployment>Boot Images>HP ProLiant Server OS Deployment node. Right-click the image, and select Properties. (Optional) You can select the Enable command support mode from the HP boot images property. This setting enables you to press F8 while in WinPE to open a command prompt to validate access to the network and storage devices, as well as to view and capture WinPE log files. The command prompt also prevents WinPE from being shut down or rebooted in case of an error during a task sequence execution. Although drivers are added to HP WinPE boot images during installation, additional network or storage drivers might be needed in the boot image to enable the WinPE boot to function correctly. You must add those through the Drivers option in the Operating System Deployment node and add them into the HP WinPE boot. Right-click one of the boot images, and select Manage Distribution Points. The Manage Distribution Points Wizard appears. To copy the package to a new distribution point, click Next>Next. Select the appropriate distribution points from the list to where this boot image is to be copied. The selected distribution points must be PXE distribution points (signified using the SMSPXEIMAGES$ share name). Click Next>Next, and then when the task completes, click Close. Repeat the above steps for the other boot image. From the console, select Computer Management>Software Distribution>Packages>HP ProLiant Server OS Deployment node. Right-click the HP ProLiant Server OS Deployment Integration package and select Manage Distribution Points. The Manage Distribution Points Wizard appears. Select the appropriate distribution points from the list to where this toolkit package is to be copied. You do not have to copy this to the PXE distribution point. Driver packages are required during Windows® OS setup and configuration. From the console, select Computer Management>Operating System Deployment>Driver Packages>HP ProLiant Driver Packages node. 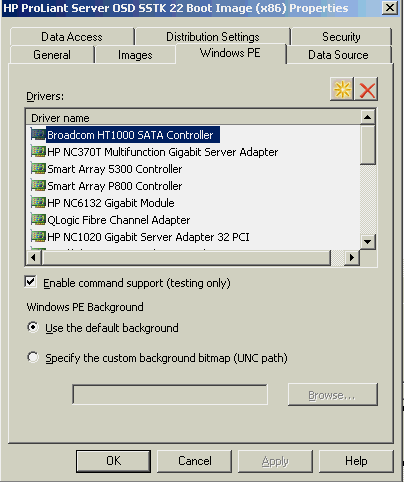 Right-click a driver package and select Manage Distribution Points. The Manage Distribution Points Wizard appears. Click Next>Next, and then select the same distribution point that you selected. Repeat steps 1-5 for all of the driver packages you want to use in task sequences.